We were out the door and at Avenida Gamarra by 7AM. I met Francois, a Canadian trekker, the previous night, and we decided to hike up to Lake Churup together. The combi wasn't leaving until 7:20, waiting for more passengers before heading off. The driver wanted to charge us 5 soles, but we were insistent on paying only 3. 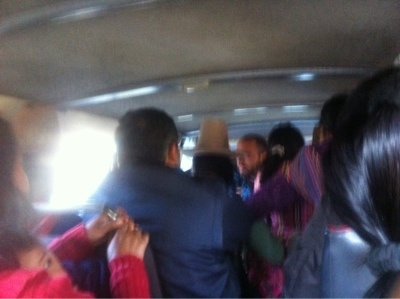 Once we started rolling, the combi picked up an additional 20 or so mostly local passengers, cramming everyone into the tiniest space available. Thirty minutes later, we got dropped off at the far edge of the town of Llupa. With what appeared to be only two parallel streets, Llupa was less of a town and more of a village. 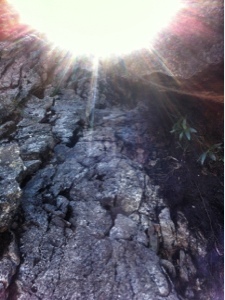 From Llupa, we hiked 40 minutes upwards on rock and gravel until we reached Pitec, where the path to Lake Churup began. After having sat around doing nothing but eating for the last couple weeks, I was feeling the effects of gluttony without matching exercise. Francois was making me look like the stereotypical American. I should have asked what he did back in Quebec. Had I known he was a personal trainer I may not had decided to hike with him. 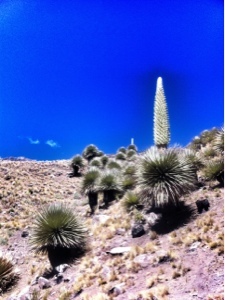 At Pitec, we paid our 5 soles to enter the Huáscarán National Park and began the ~1,500 meter hike up (over ~3.5 km). The path was rocky with sometimes large rocks to climb over and at other times small gravel to walk upon. At some points it wasn't clear where the path went, so it was a matter of guessing. There was a point where the path suddenly ended. But turning to my left, I saw a near vertical wall. I guess I was supposed to climb it. With 15-20 minutes left, I found myself at the base of a small waterfall. Here was the tricky part. After about 20 meters up along the left of the waterfall it turned from trekking to mountain climbing. 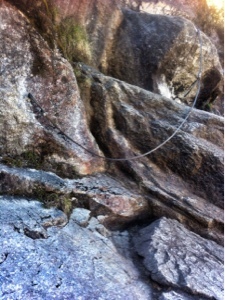 There were intermittent metal ropes that provided support to shimmy up, but was definitely not for the faint of heart. One rope near the top had previously become detached on one end, making it slightly dangerous should someone were to depend on it for support. At the top, Lake Churup greeted us in all its glory. The blue and jade green water of the lake was a jaw dropping sight. When the wind was calm, the reflection of Mount Churup was visible in the lake. Surprisingly, there were only seven of us up there, making it worth the effort up. After an hour or so, we began our hike back down, which included shimmying down the rock face we went up earlier. The path was strewn with small gravel in most places, making it a slippery hike down. 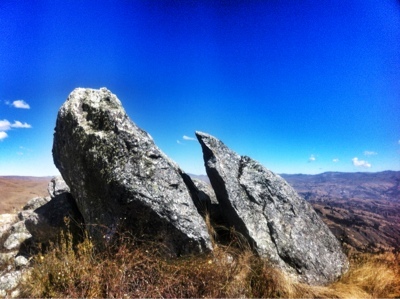 At the bottom, it was a 30 minute hike back to Llupa, where we managed to find a combi to take us back to Huaraz. Take a combi from Avenida Gamarra (near where the river is) for 3 soles. Don't let the driver try to squeeze more out of you, since locals only pay 1.5 soles. Get dropped off at Llupa and hike the 40 minute path to Pitec. Alternatively, skip the Llupa to Pitec hike and get dropped off at Pitec instead (this will cost you a couple extra soles). 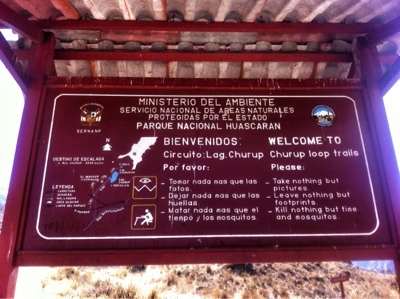 At Pitec, pay the 5 soles entrance fee into Huáscarán National Park and follow the path up. Along the Llupa-Pitec path, you'll come along a fork - go left as there's currently construction on the right. As you'll be scaling upwards ~1,500 meters from Pitec (~3,000 meters) to Lake Churup (~4,500 meters), it's going to get cold, sunny, and windy. Bring sunscreen, chapstick, layers, water, and lunch. A pair of gloves is helpful for the last bit of the trek, as they'll give you grip and protect your hands as you scale up the near vertical mountains, holding onto the metal ropes as if your life depends on it (it does). Time depends on whether you start at Llupa or Pitec, and how long you choose to stay at Lake Churup. We spent a bit of time up at Lake Churup and hiked to and from Llupa. 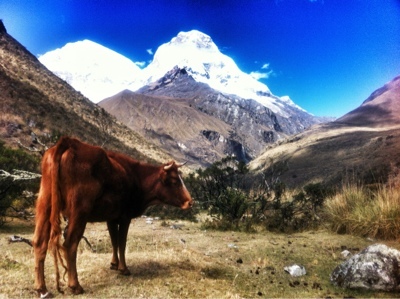 Altogether, roundtrip from Huaraz-Llupa-Pitec-Churup was about 8 hours. The next day, it was Laguna 69. Though it's possible to take public transportation to Cebollapampa, where the trek begins, transportation back is less than guaranteed. Instead, I booked myself a seat on a tourist bus (yuck) through my hostel for the three or so hour ride there. After paying another 5 soles to enter the park, we began our way up. 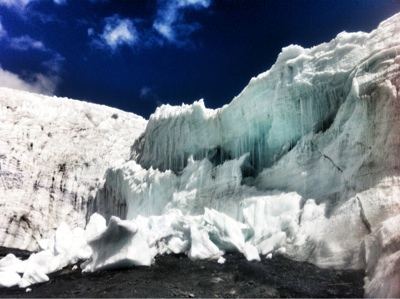 Laguna 69 is located at ~4,600 meters above sea level, making it a roughly 1,600 meter vertical climb up from Cebollapampa. The path starts out fairly flat, passing through fields where cattle stand lazily in the sun. About an hour in, we were greeted by a false Laguna 69 - maybe it was 65? Though the view was impressive, it wasn't 69. The path then opened up to a wide plateau, where more cattle stood, grazing on the brown grass. 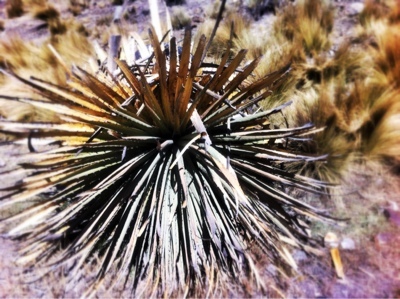 The plateau was like a minefield of cattle / donkey poop, so watch your step. 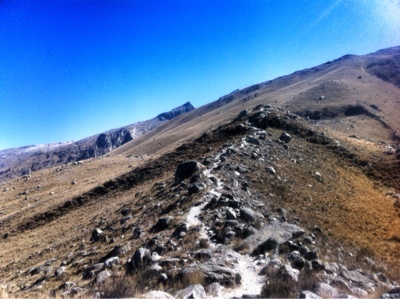 The last hurdle of the trek consisted of a series of switchbacks. The slope wasn't necessarily steep, but the thin air at that altitude made it more difficult than usual. One of the other trekkers said her hostel told her it took folks somewhere between 20 minutes to an hour to climb up the zig zags. With Lake Churup as preparation, I managed it in 24 minutes. At the top, the path flattened out for about 20-30 meters. After a little under two hours, I knew Laguna 69 was at the end of the path, and started running, albeit a bit precariously given the narrow path and the steep fall it would had been should I accidentally trip. Then, bam. 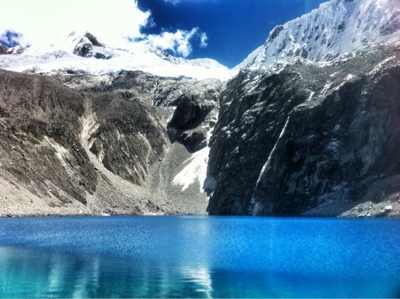 The view was a stunning blue green lake at the base of an enormous snow capped mountain. Behind Laguna 69 stood the majestic Nevado Chacraraju, from which we heard the crunching noise of an avalanche somewhere high above. Next to the deep blue alpine lake were rocky hills that provided a higher view of the landscape. Even though some of the larger rocks were loose, it was a quick climb up. After lunch at the top, I slowly made my way back down. I went down a different direction from which I went up, encountering smaller rocks that gave me barely anything to gain traction on. Therefore, it wasn't a surprise when I created a mini rock avalanche tumbling down in front of me. It was a sharp reminder to quickly find a better path. Hop on a combi to the Yunguay bus terminal from Avenida Gamarra. There, get on another van to Cruz de Pisco. Alternatively, book a tourist bus via your hostel. 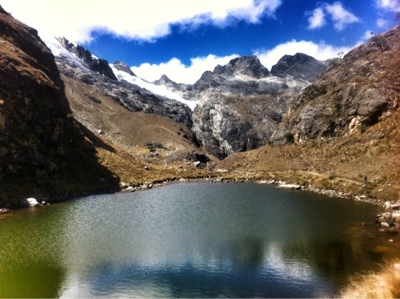 Like Lake Churup, you'll be hiking upwards of 1,500 meters, so bring sunscreen, chapstick, layers, water, and lunch. 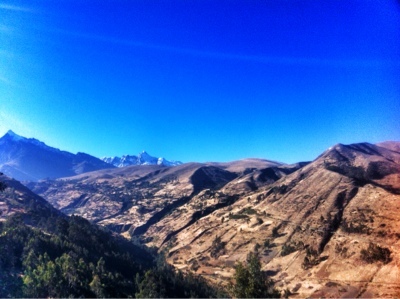 About 9-10 hours roundtrip from Huaraz, with 6 hours spent in commute between Huaraz and the start. This will vary depending on your mode of transportation. 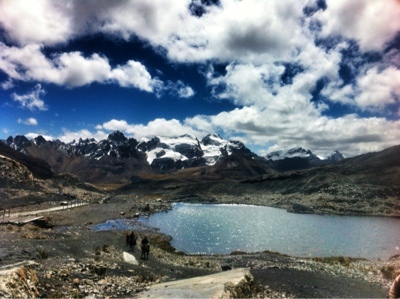 My third day in Huaraz ended up being less physically demanding than the first two. 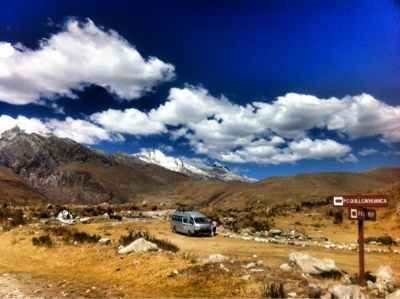 I was, unfortunately, on another tour bus that had me going in circles for over an hour in Huaraz as the bus picked up passengers for other tours and dropped them off at the agency's terminal. I was also shuffled around a couple buses until they found enough passengers. I also had to endure the guide taking us to a cafe twice - once for tea and another for dinner - at 3PM! Wolfgang tango foxtrot. 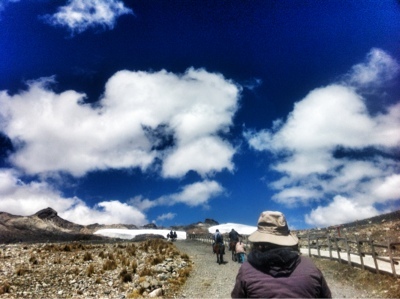 We were heading to Pastoruri Glacier, a 2.5 mile long glacier in the southern part of the Cordillera Blanca. After two hours of a mix tape that consisted of Dido's Thank You and REM's Losing My Religion intermixed with songs of a more local flavor, we arrived at the entrance of the Huáscarán National Park (and again paying another 5 soles). Along the drive up to Pastoruri, we stopped to take a look at the puya raimondii, a giant plant of the pineapple family that flowers only once every 50-100 years and subsequently dies. 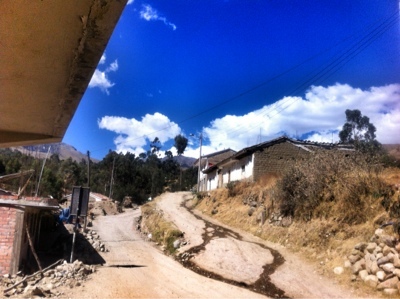 As we approached Pastoruri, the elevation increased to over 5,000 meters above sea level. A lot of folks on the tour were very much out of breath just from getting in and out of the bus. And so it would explain why there were horses readily available to take us where the bus couldn't go. We were back on foot for the remaining 100 meters or so. As we approached closer and closer, the giant that was Pastoruri revealed its full size. 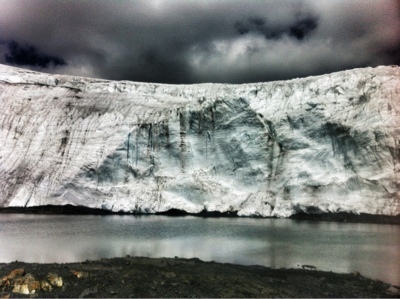 Icicles hung from crevices and ponds of water collected where the glacier was retreating. Though it wasn't extremely cold, the added wind sent a chill through me as I walked through the rocky terrain that surrounded the glacier. I only got whistled at once by the park official for standing on a natural ice platform. Oops. Book a tour through your hostel or hire a taxi for the day. Public transportation may be available, but not guaranteed to take you all the way. Drink some coca tea or chew some coca leaves. 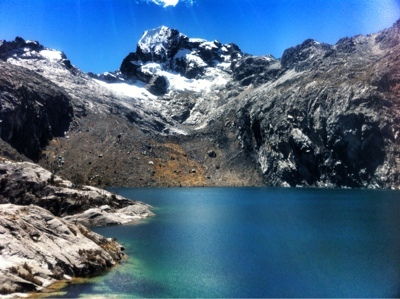 I didn't have any altitude sickness symptoms while in Cuzco, Huaraz, Lake Churup, and Laguna 69, but I was starting to feel a slight headache after about half an hour at Pastoruri. It's high up. 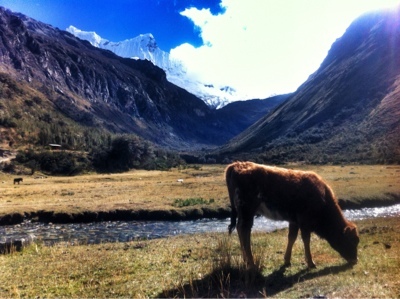 Depends on the tour agency, but it'll vary between 6-8 hours roundtrip from Huaraz. 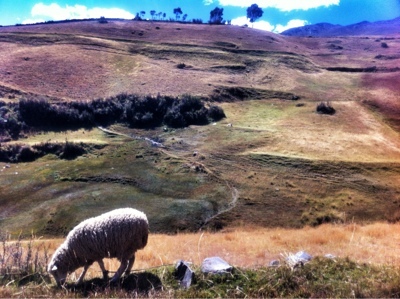 Next up, a foodie adventure in Huaraz with a Texan.